From the 1000% overload protection of the DXL series to the heavy duty tubular welded construction of the DSS and DMS series, nothing lasts as long as a Doran Scale base. Choose a Doran Weight Indicator to be calibrated to it for a complete weighing system. From the 1000% overload protection of the DXL series to the heavy duty tubular welded construction of the DSS and DMS series, nothing lasts as long as a Doran Scale base. Doran’s exclusive “Quad Spring” DXL design provides the very best in shock and static overload protection. The DXL employs shock absorbing springs to protect the load cell when something is dropped on the scale. The DXL also has heavy-duty static overload stops to protect the load cell when excessive weight (up to ten times the capacity) is placed on the scale. Doran’s DXL Bases are built tough and deliver the best load cell protection available. Built with 304 Stainless Steel, the DXL Base is made to endure heavy washdown. IP66 load cells are sealed and grounded to prevent water damage and ESD problems. Improve your weighing results with a DXL Scale Base. Every DXL Base has a Doran series I load cell capable of delivering linear weighments up to 30,000 divisions. Be assured of accurate results—choose a Doran DXL Base. The DXL series bases is available in four different base sizes: 8" x 8", 10" x 10", 12" x 12", or 15" x 15". DXL series scale bases are equipped with adjustable feet, allowing up 3/4" height adjustment. DXL7002/88 ..... 2lb / 0.9kg / 32oz ......... 8" x 8"
DXL7005/88 ..... 5lb / 2.3kg / 80oz ......... 8" x 8"
DXL7010/88 ..... 10lb / 4.5kg / 160oz ..... 8" x 8"
DXL7025/88 ..... 25lb / 9.1kg / 320oz ...... 8" x 8"
DXL7002 .......... 2lb / 0.9kg / 32oz ......... 10" x 10"
DXL7005 .......... 5lb / 2.3kg / 80oz .......... 10" x 10"
DXL7010 .......... 10lb / 4.5kg / 160oz ...... 10" x 10"
DXL7025 .......... 25lb / 9.1kg / 320oz ...... 10" x 10"
DXL7050 .......... 50lb / 22.7kg / 800oz .... 10" x 10"
DXL8050 .......... 50lb / 22.7kg / 800oz ..... 12" x 12"
DXL8100 .......... 100lb / 45kg / 1600oz ..... 12" x 12"
DXL9050 .......... 50lb / 23kg / 800oz ........ 15" x 15"
DXL9100 .......... 100lb / 45kg / 1600oz .... 15" x 15"
DXL9200 .......... 200lb / 91kg / 3200oz .... 15" x 15"
Just what you need for heavy washdown tasks. 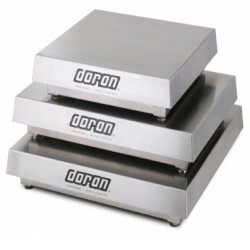 The Doran DSS Series Bases offers years of use in tough food plant tasks. Wash it! Hose it! Spray it! The DSS keeps on working—the quality scale base solution for every food processing or industrial application. Built to last and made to perform, that’s the Doran DSS Scale Bases. Welded tubular construction, 6 overload stops, and time-proven Doran designs all add up to trouble-free performance. The 18" x 18", 18" x 24", or 24" base sizes are available in maximum capacities from 100 to 1,000 lbs. Built to last and made to perform, that’s the Doran DMS Scale Bases. Welded tubular construction, 6 overload stops, and time-proven Doran designs all add up to trouble-free performance. Built for years of reliable use, the Doran DMS Mild Steel Bases are remarkably rugged. A two-part polyurethane finish provides excellent wear and abrasion protection, and the DMS 7 Overload Stop System protects the load cell from shock and overload damage.